Recent commercial discoveries and modern 2D seismic in the Tobago Basin suggest that prolific natural gas reserves may extend far beyond the established trend and play concepts. Seismic section through KK 6-1, the discovery well for the Patao-KK biogenic gas trend. Source: PGS Source: Sergio Leenan In May 1971, a shallow water new field wildcat (NFW) located in the southern Tobago Basin offshore north coast Trinidad reached total depth in basement at 2,740m. The seismically derived objectives of well KK 6-1 – bright, Mio-Pliocene sandstones on structure – tested dry gas and were consequently abandoned. Although stranded at the time, KK 6-1 had discovered the Patao-KK biogenic gas trend, a play boasting 2P recoverable reserves of 935 MMboe within Trinidad’s North Coast Marine Area (NCMA) and 1,206 MMboe within eastern Venezuela’s Mariscal Sucre field complex. Established Patao-KK gas fields (2P RRE from IHS 2011) The Tobago Basin is a forearc basin located in the south-east Caribbean Sea between the Lesser Antilles Arc and the Barbados Accretionary Prism. The basin is bound on the north by the St Lucia Ridge and to south by the Araya-Tobago metamorphic basement of the Araya Peninsula, Venezuela and the Northern Range, Trinidad. It holds up to 14 km of Cenozoic sedimentary fill with thick sequences of Mio-Pliocene sediments. The basin formed through an initial phase of oblique collision tectonics between the Caribbean Arc and South American continent and evolution to an oblique transform margin with transpressional tectonics governing the Paleogene and transtensional tectonics dominating the Neogene. The age and origin of the basin’s basement is unknown, but evidence suggests that it is Late Cretaceous and of arc affinity. 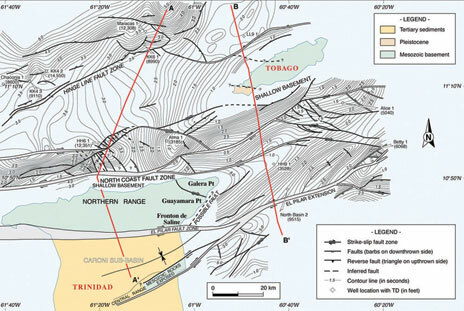 Predominant structural features in the southern Tobago Basin are the North Coast Fault Zone (NCFZ) and the Hinge Line Fault Zone (HLFZ), principal components of a broad zone of east/north-east to west/south-west trending faults associated with the southern wrench fault boundary of the Caribbean plate and controlling structural and sedimentalogical evolution of the basin. The approximately 135 km long HLFZ is a right-lateral strike-slip fault running north-east to south-west, dipping steeply to the north-north-west, and with a component of dip-slip displacement down to the south in the west and to the north in the east. 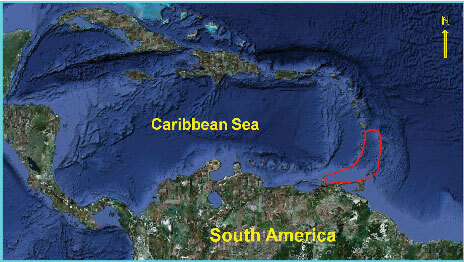 The HLFZ defines a structural and bathymetric break between the shelf to the south and the deepwater Tobago Basin to the north, and possibly coincides with a major tectonic terrain boundary separating the northern edge of the Caribbean arc from thinner, oceanic basement underlying the basin to the north (Robertson and Burke, 1989). Distal to the HLFZ the basement steepens rapidly northwards. Basement faulting along the HLFZ remains active and cuts the overlying Neogene section. Seismic shot in 2009 indicates that charged Mio-Pliocene reservoirs exist updip from the HLFZ (Upper KK 6-1 Reservoir with VATRMS +/- 0.05s) The majority of clastic sediment deposited in the basin was sourced from the south as the Caribbean plate moved eastward along the passive margin of South America. Slow slab rollback during the Paleogene created broad flexural subsidence across the forearc and controlled Paleogene deposition in the basin. Flexural and thermal subsidence concluded in the middle Eocene producing a wide, deepmarine forearc basin with approximately 8 km of Paleogene sedimentary fill of predominately deep-marine pelagic shales and siltstones and deepwater turbiditic sandstones (Aitken, 2005). Steady eastward advancement of the Caribbean plate brought it to oblique convergence with the South American plate during the Late Oligocene to Middle Miocene. Outcrop and well data indicate continued deep-marine sedimentation dominated by turbidites in the Early to Middle Miocene when abrupt regional shallowing of clastic facies culminated in the Middle Miocene un conformity. Sedimentary infilling of the Tobago Basin’s southern shelf and slope began in the Early Miocene with con glomerates and sandstones up to 900m thick unconformably infilling lows between structural highs defined by the NCFZ and HLFZ. In areas of paleo-highs, conglomerates are absent and sands and shales lie directly on basement. Clinoforms in the basin indicate north-north-east progradation of the distal Proto-Orinoco delta in response to forced regression during Miocene uplift of the Northern Range in Trinidad and the Paria Peninsula in Venezuela (Robertson and Burke, 1989). Sediment thickness of the early Neogene section below the Middle Miocene unconformity is approximately 3.5 km. Upper Miocene deposition is characterized by diffuse transtensional tectonics with Upper Miocene and Lower Pliocene sediments downlapping onto the Middle Miocene unconformity as the depocenter in the basin shifted to the south-south-east due to increased Proto-Orinoco sediment influx. Transtensional, oblique strike-slip motion along both the NCFZ and HLFZ increased accom modation on the shelf through the late Pleistocene, allowing deposition of thick sequences of Miocene and Pliocene clastics south of and across the Patao High and Tobago Arch. Pliocene sediments deposited along the shelf and slope of the Tobago Basin are predominantly silty claystones with thin interbeds of fine-grained sandstones, conformably overlying Top Miocene and reaching thicknesses of ~1,200m. Pleistocene sediments are primarily shales with interbeds of deltaic sands and reefal limestone conformably overlying Top Pliocene. Sediment thickness above the Middle Miocene unconformity is approximately 3.5 km. Dip seismic section Tobago Basin, Trinidad and Tobago. Most hydrocarbon reservoirs offshore Trinidad and Tobago are found in Tertiary shelf and shelf-edge deltaic depositional systems and the Patao-KK fields are no exception. Reservoir, trap, and seal for the Patao-KK petroleum system reside within the Upper Miocene and Lower Pliocene progradational shelf and shelf edge deltaic depositional systems of the Tres Puntas and overlying Cubagua formations. These sediments were deposited within actively deforming basins in shallow marine settings along the northern margin of South America. Patao-KK gas is very dry (> 98% methane) and assumed to be either auto chthonously sourced from pro del taic mudstones coeval with Mio-Pliocene reservoir units (Schenk, 2000) or the product of anaerobic bacterial de composition of thermogenically derived hydrocarbons sourced from deeper in the Tobago Basin. Condensate production, higher in Patao-KK fields nearest the shallowing basin axis in Venezuela, confirms at the least a thermogenic system functioning in the deeper Tobago Basin. Reservoirs are Upper Miocene to Lower Pliocene fine-grained deltaic sandstones and siltstones with porosities ranging from 13–29% and permeabilities ranging from 10–1,100 mD. These sands are highly unconsolidated with interstitial clays and interbedded shales. Some reservoirs within the Mariscal Sucre field are rumored to be turbiditic sandstones. If autochthonously sourced, hydrocarbon migration occurs from underlying mudstones into sandstone reservoirs and updip into structural and combination traps developed along the HLFZ. Vertical migration along faults is observed, often charging Pleistocene sands. Seals in the play are formed by intraformational argillites and shales. 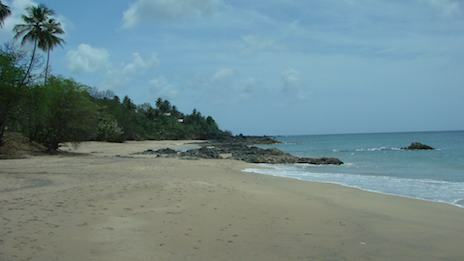 Geophysical surveys first commenced in the southern Tobago Basin offshore north coast Trinidad in the late 1960s and continued into the early 1970s when operators were first granted exploration concessions. With structurally conforming bright amplitudes in Mio-Pliocene sands along the HLFZ as a road map, Deminex GmbH followed their 1971 KK 6-1 (Orchid) discovery in 1975 with NFW KK 4-2 drilled on a broad, faulted anticline establishing the Poinsettia Field. Looking east again, Deminex drilled the NFW LL 9-1 just off the north shore of Tobago in early 1976, testing dry gas in Pleistocene sands as well as Mio-Pliocene reservoirs. The Chaconia field was discovered by TRINTOC in early 1981, followed by Hibiscus later that year. All Patao-KK field discoveries in Venezuela were made by PDVSA between 1979 and 1981. BG Group, AGIP and VEBA signed a unit ization agreement with Petrotrin in 2000 to jointly develop the Chaconia, Hibis cus, and Poinsettia fields. The unit’s sole production platform was constructed on Hibiscus in 2001 jointly with a 100 km pipe line to Point Fortin on the west coast of Trinidad. The Hibiscus platform began production in August 2002 and currently supplies 365 MMscfpd to local LNG trains (BG Group, 2011). The Orchid and LL 9-1 (Iris) fields remain undeveloped and within the recently assigned NCMA-4 concession. After years of delays and several consortiums later, PDVSA is currently drilling development wells in Mariscal Sucre and profess plans to bring these fields on-line in the near future. Decades after all the original Patao-KK discoveries were realized, Petro-Canada discovered the Cassra and Sancoche fields in 2008, extending the Patao-KK biogenic gas play north-eastward with what appear to be gentle combination traps unrelated to traditional structural mechanisms of the HLFZ. Cassra is currently under appraisal. Although the established trend of commercial Patao-KK discoveries parallel and are north of the HLFZ, 2009 2D seismic indicates that charged Mio-Pliocene reservoirs exist updip from the HLFZ in combination traps associated with strike-slip faults within the NCFZ. Comprehensive 2009 2D seismic coverage of the deeper West Tobago Basin and Tobago Platform suggest Mio-Pliocene reservoirs exist along the Tobago Ridge north-east of the island, and extending northward from Sancoche into the deeper Tobago Basin. 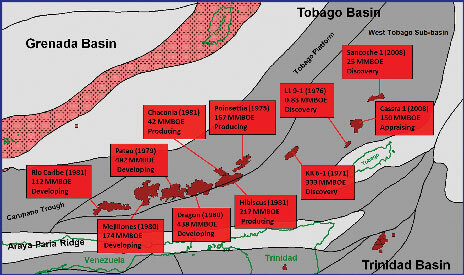 Although elusive to date, the quest to establish a commercially viable thermogenic petroleum system in the underexplored Tobago Basin persists. Given the structural and sedimentological disposition of the deeper basin, there is reason to be optimistic. What is the hydrocarbon potential of the Mozambique Channel, and what has the ‘Golden Zone’ theory got to do with it?